A group of 25 demonstrators protested open carry gun laws last Thursday in front of a pizza restaurant in which roughly 60 holstered patrons ate dinner. 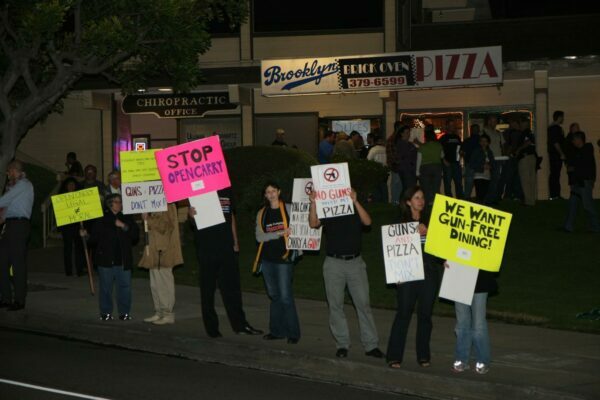 Supporters of the Brady Campaign, an organization dedicated to reducing gun violence, showed up during the South Bay Open Carry’s monthly family dinner, held last week at Brooklyn Brick Oven Pizza, 500 S. Sepulveda Blvd., in an attempt to discourage the restaurant from allowing customers to bring guns into the restaurant. In recent months, South Bay Open Carry, an organization dedicated to protecting citizens’ right to bear arms, has drawn attention as members have showed up to various events in the South Bay with unloaded guns holstered to their hips. State law permits the carrying of unloaded firearms that are visible. Ammunition may be carried separately. Many residents expressed outrage when the group insisted on carrying guns to last summer’s Hometown Fair, though SBOC founder Harley Green insisted that the fair was on public property and the group well within its rights to carry there. SBOC holds regular monthly dinners at restaurants where owners have been informed of the group’s intention to carry, Green said. While the group frequents restaurants, such as Ruby’s Diner in Redondo Beach and Tony’s Deli in El Segundo, earlier this month, some members were kicked out of Red Robin restaurant in Redondo Beach for open carrying. Verge, whose brother was the victim of a gun murder in 2000, was not so optimistic. She said she is disturbed by the fact that many open carriers “brag” on websites about being able to load guns in two seconds. She also said that some of the open carriers taunted her in front of Brooklyn, saying they knew the names of her family members. Billie Weiss of the Violence Prevention Coalition of Greater Los Angeles pointed to recent events, such as a Jan. 8 shooting in Tucson, Arizona (see cover story) and a Jan. 5 suicide of a Palos Verdes High School student as reasons for cracking down on gun laws. Green, citing studies, said that in areas where open carrying is allowed, violent crimes are deterred. Brooklyn Oven Pizza owner Bob Udovich was too busy baking pizzas to pay any attention to the commotion and news vans outside his restaurant.